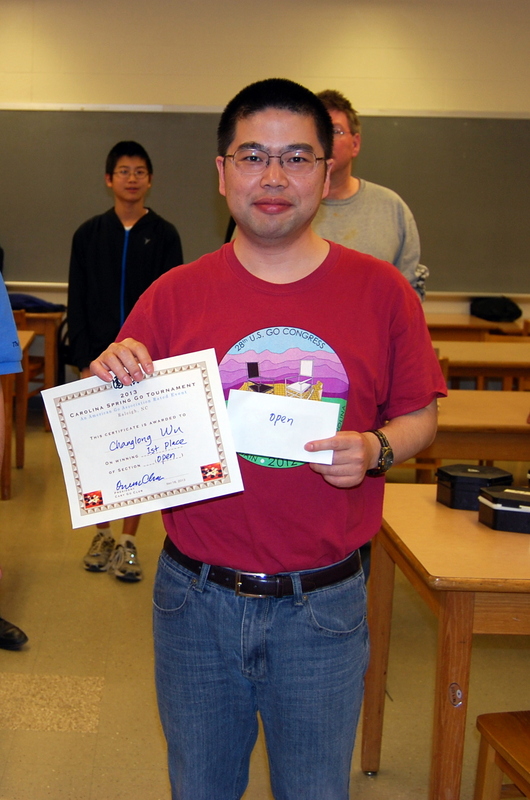 An undefeated Eric Lui 7D won the 2013 Maryland Open and NAMT Qualifier, held May 25-26 in Baltimore, MD. A total of 52 players “enjoyed beautiful weather for the 40th Maryland Open,” reports organizer Keith Arnold. Eight players 4-dan and above competed for NAMT points. Gurujeet Khalsa directed the 5-round event. The 10th annual Carolina Spring Go Tournament featured a hotly-contested team competition for the youth players. Four teams representing Raleigh Academy of Chinese Language (RACL), Cary Chinese School (CCS) and Chinese School at Chapel Hill (CSCH) competed in the team tournament at the May 18 event, held in Raleigh, North Carolina and organized by the Cary Go Club and the Chinese-American Friendship Association of North Carolina. 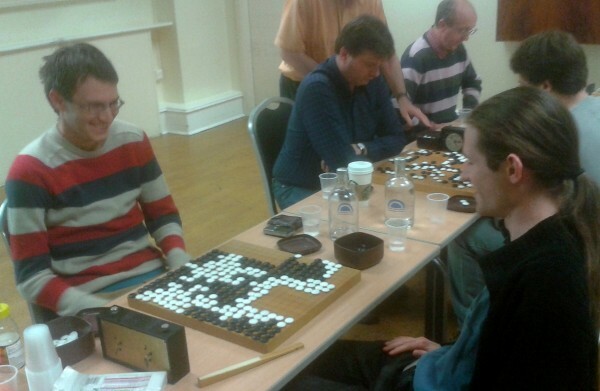 The tournament attracted 30 go players with ages ranging from 6 to 70 years old. In the individual competition, a new Duke student, Liqun Liu, who was a 5 dan in China, gave long-term North Carolina champion Changlong Wu 7d (left) a fierce challenge. 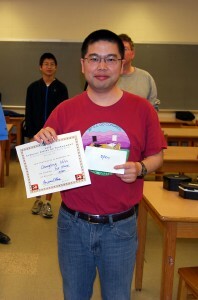 Wu won the close match against Liu and eventually won the open section with a perfect score of 4-0. Liu finished the second place in the open section with his only loss to Wu. 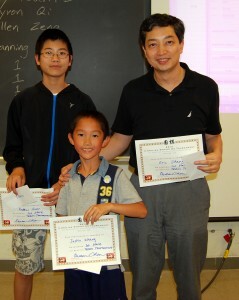 Xiaoping Wu 1d won Section A (1d-2d) with a perfect score of 4-0. John Zhu 9k won Section B (9k-1k) with a score of 3-1. Tom Carlson 10k topped Section C (15k-10k) with a perfect score of 4-0. Justin Zhang 19k, who was a member of the Chinese School at Chapel Hill team that won the team competition, also won the indiviual champion in Section D (25k-16k) with a 4-0 score. Now, after finishing work on his latest project at Sony, “God of War: Ascension,” Fiedler has finally turned his attention to programming go. 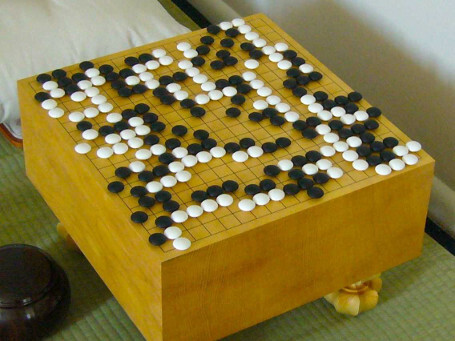 The idea is not to provide an AI opponent, but instead provide a beautiful and compelling simulation of an actual 3D goban and stones that other developers could include in existing go software like SmartGo or Many Faces of Go, Fiedler said. It is a painstaking step-by-step effort he is chronicling in a blog on his website, Gaffer on Games. The blog lays out the code and the physical reasoning behind it. Fiedler hopes to make some commercial use of the software eventually, though it will be hard to do. In the meantime, that’s not what’s on his mind. “I’ve had some time to work on my dream project after almost 10 years. It’s really satisfying.” -Andy Okun. 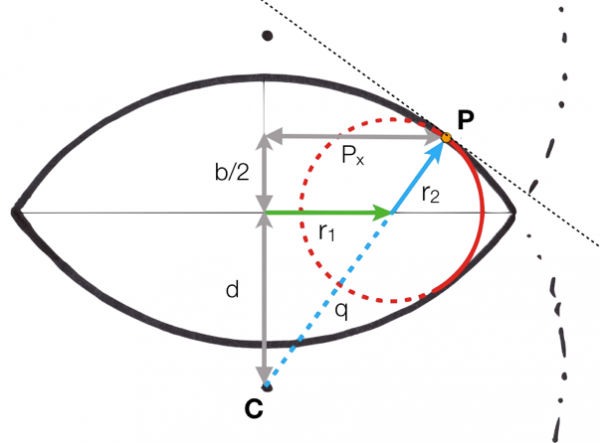 Diagram of a stone from Fiedler’s blog: Gaffer on Games. A recent article on the Business Insider website extols the mathematical benefits of the game of go, which is the 6th of 13 Things That You Can Do To Make Your Child A Genius At Math. Can you tell who is ahead in the go position that the article displays? (Assume Black to play and a komi of 6.5.) The full article appears here. Thanks to Chris Sira for sending the link. Incumbent Paul Celmer has been nominated to retain his seat as eastern region representative. No nominations for western or central region candidates have been received yet. Nominations close June 15 and should be sent to elections@usgo.org. 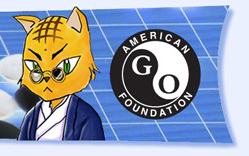 Qualifications and procedures are here http://www.usgo.org/aga-board-elections. AGA rules resolve the issue by making full board repetition illegal, which turns this situation into what is called “Super Ko“. AGA Rules Coordinator Terry Benson says: “The main point of AGA rules is that the players have to figure and play it out – not the ref – and we have no null games. A triple ko is going to prohibit the 6th move. So who starts matters. Thus finding a ko threat on move 6 which the opponent answers, would reset the triple ko with the other player to start. I think Ing rules would be the same. This is a fighting ko.” See move 257 to illustrate the options. 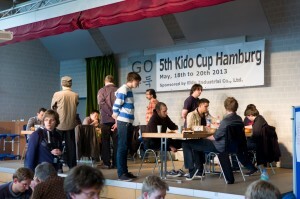 The fifth annual Kido Cup was held in Hamburg, Germany May 18-20. The three day event, including a main tournament, top group, and kids tournament, has become the largest go event held in Germany. In addition to the tournaments, this year’s Kido Cup also featured numerous side events, including six visiting pros from Korea playing teaching games and giving game reviews. Lukas Podpera 5d was the champion at the main tournament among a field of 198 players. Full main tournament results are available here. 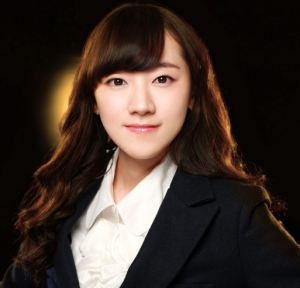 Fan Hui 2p, a pro from China living in France since 2000, won the top group with a 6-1 record. Top group results are available here. Arved Pittner 5k from Berlin won the kids tournament. Full results are available here. Story by Jan Engelhardt, photo by Joachim Beggerow.